Portable oxygen concentrators free users from lugging around heavy oxygen bottles. These fit into a small space and can be carried by most people with sizes from 6 pounds to nearly 20 pounds. The introduction of these concentrators has given more freedom to those who require oxygen and now no longer have to handle large oxygen bottles. A portable oxygen concentrator draws oxygen from the air and removes other gases to concentrate the oxygen to a purer form. This eliminates the need for a regular supply of oxygen bottles, which pose hazards when improperly stored. The entire oxygen concentrator needs no additional parts or supplemental oxygen to operate. It is entirely self-contained. Traveling on public transportation is easier with a portable oxygen concentrator. Most of these units are approved by the FAA for use on airplanes during flight, and they do not take up so much space. 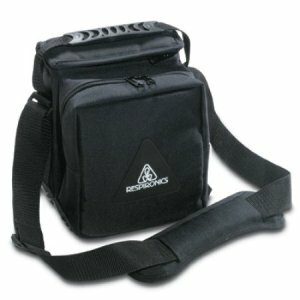 Portable oxygen concentrator bags with straps or handles make carrying the concentrator easier. Pockets in the bags can be used to carry a pulse oximeter to monitor oxygen levels in the blood. Portable Oxygen Concentrators – Comes with a carrying bag and strap. Weighs just 10 pounds. Depending on the insurance plan, the $2,000 to $4,000 cost of an oxygen concentrator may be covered, especially if it is used to treat conditions like COPD. Those who want to upgrade from oxygen bottles to a portable concentrator should check with their insurance agent to see if it is a covered expense. Maintenance on these concentrators is minimal. Most units only require a regular cleaning of the filter inside and recharging of the battery. The battery life on these machines ranges from 90 minutes on the highest flow setting to six hours or more on the typical setting. Some oxygen concentrators can use the cigarette lighter in a car to charge their batteries, but others require only a home outlet for charging. Portable oxygen concentrators allow users the freedom to move around and travel without the need to change oxygen bottles or carry them. Insurance coverage makes these units affordable for those who require oxygen, and their low maintenance and ease of use makes them appropriate for a wide range of people. Patients interested in portable oxygen concentrators should discuss the device with their physician and insurance agent to determine if it is the right option.